Hyundai?s Genesis luxury brand established its footing with the G80 and G90 sedans, but now the real challenge begins. Genesis is taking on the likes of the BMW 3 Series, Audi A4, and Mercedes-Benz C-Class with a smaller sedan. The 2019 Genesis G70 launched in its home market of South Korea late last year, but its first appearance on this side of the Pacific is at the 2018 New York Auto Show. 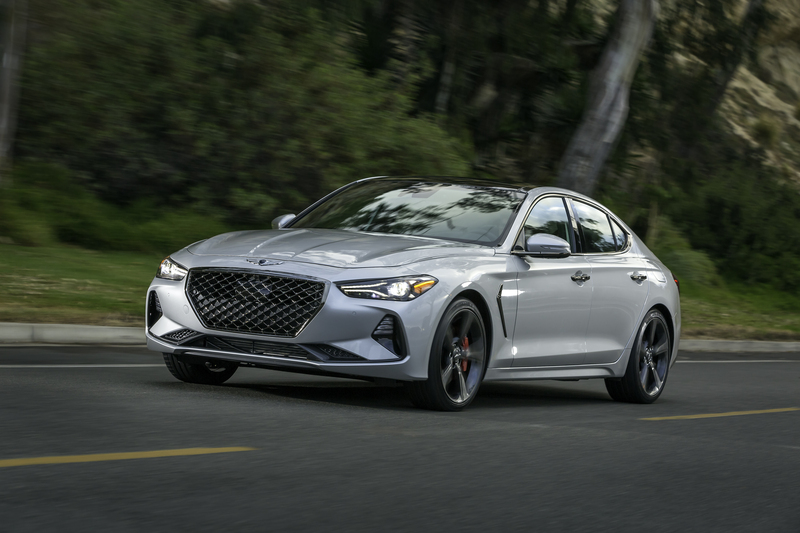 Like the German luxury brands Genesis aims to match, the G70 takes elements from its larger siblings and applies them to a more compact package. But will that be enough to make this Korean upstart stand out in an already crowded segment? While it bears a familial resemblance to the G80 and G90, the G70 is a bit more stylish than those conservative-looking sedans. Genesis? massive Audi-like grille is present, but the entire front fascia is aggressively folded and creased, almost like the car is squinting and wrinkling its face in an attempt to look intimidating. The G70 sports appealing long-hood, short-rear-deck proportions, while at the back big exhaust outlets and curled trunk lid try to convey sportiness. U.S. G70 buyers get a choice of two gasoline engines. A 2.0-liter turbocharged gasoline four-cylinder produces 252 horsepower and 260 pound-feet of torque, while an available 3.3-liter twin-turbo V6 produces 365 hp and 376 lb-ft. The V6 G70 is the quicker of the two, doing 0 to 60 mph in 4.5 seconds, according to Genesis. That engine is shared with the G90 and G80 Sport, as well as the Kia Stinger, which also rides on the same basic platform as the G70. As in those cars, the G70 gets standard rear-wheel drive or optional all-wheel drive. Showing that it knows its target audience well, Genesis will offer a six-speed manual transmission on the G70. Considering that many other performance-oriented cars are shifting to automatics, it?s a major coup for driving enthusiasts. Granted, the manual can only be had in base 2.0-liter models with rear-wheel drive. If you want the V6 or all-wheel drive, you?ll have to settle for an eight-speed automatic. On the inside, the G70 sports a clean-looking dashboard, marred only by an infotainment screen that seems to have been tacked on as an afterthought. The system that 8.0-inch screen is attached to supports Apple CarPlay and Android Auto, at least, as well as Amazon Alexa connectivity. The G70 also gets a host of driver-assistance features such as adaptive cruise control, blind-spot monitoring, and forward collision warning with autonomous emergency braking. The 2019 Genesis G70 goes on sale this summer. Pricing will be announced closer to the launch date.